The Social Performance Task Force (SPTF) and the European Microfinance Platform (e-MFP) have released a study on the Assessment of the Sustainable performance of SME finance institutions drafted by Lucia Spaggiari, SPTF/e-MFP Social Investors Action Group and MFR Business development director. The metrics adapt the Universal Standards of Social Performance management (integrated in SPI4 and Social Rating) to the different goals, language and needs of SME finance. The final paper will be released during the European Microfinance Week 2018. This sponsored feature is the ﬁrst in our 2018 series on European Microﬁnance Week, (EMW), which will be held from November 14 through 16 in Luxembourg by the European Microﬁnance Platform (e-MFP), a network of 130 ﬁnancial-inclusion stakeholders. MicroCapital has been engaged to promote and document the event. Lucia Spaggiari: One difference is the language used. 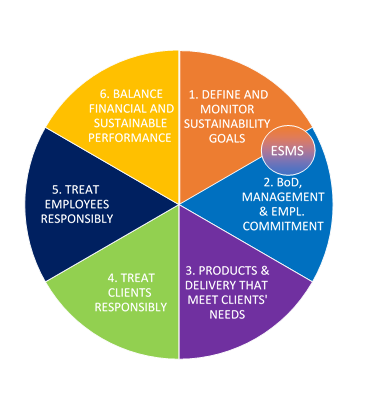 For instance, SME lenders speak of “sustainable performance” more than “social performance.” Beyond language, a key difference is scale. By deﬁnition, SME lending requires a larger balance sheet, and this means complying with prudential regulation and attracting investors expecting to earn (at least) market returns. Laura Foose: Based on investor demand expressed at the e-MFP Investor Action Group meeting at EMW 2016 and the March 2017 Social Performance Task Force (SPTF) Social Investors Working Group, we have been exploring how best to evaluate the environmental and social performance of SME ﬁnance institutions. We began by mapping the ESG frameworks of four development ﬁnance institutions (DFIs) and then surveyed our member microﬁnance investment vehicles to learn what indicators were most important to them. The high quality of the DFIs’ tools was very helpful in designing an evaluation framework that is feasible for our member funds’ smaller investments. MicroCapital: What types of social measures do you consider? Lucia Spaggiari: In SME lending, the concept of “social” encompasses a broader group of stakeholders: in addition to clients, the assessment needs to cover the employees of the SMEs ﬁnanced as well as the communities in which the SMEs operate. Compared with the missions of microlenders, which often focus on the ﬁnancial wellbeing of the client, SME lenders are more oriented toward economic growth and job creation. However, client protection indicators remain very relevant. They also happen to be similar to the indicators we use to measure how SME lenders treat their personnel. In general, the assessment framework of social performance management (SPM) for microﬁnance institutions – although we think in terms of sustainable performance management – remains applicable. This includes its structure of deﬁning goals, aligning systems, benchmarking and making improvements. However, we must adjust for the different development goals of SME lenders and their broader scope of stakeholder groups. MicroCapital: What issues arise when considering environmental performance? Lucia Spaggiari: The bar for managing environmental performance is much higher for SME lenders than for microlenders. It requires the systematic use of assessment and improvement tools that are speciﬁc to each sector, geography, enterprise size and other contextual factors. MFIs often have no screening system at all, or they simply consult a list of excluded activities. Most MFIs that are moving into SME lending will need to acquire a signiﬁcant amount of new expertise in this area. MicroCapital: How do these factors ﬁt into the existing SPM ecosystem? Lucia Spaggiari: While the aspirations, operations and risks of SME lenders are different in some ways from those of microlenders, the SPTF Universal Standards and the Smart Campaign’s Client Protection Principles largely remain applicable if we adjust the bar, enlarge the scope and adapt some of the language. Laura Foose: The end goal of this work is to create a module for SME ﬁnance within the SPI4 tool which is in broad use by investors with their microﬁnance portfolios. As investors expand their portfolios into SME ﬁnance, this would allow them to continue using the same tool with which they have already developed familiarity and conﬁdence. Lucia Spaggiari serves as the business development manager for MFR and leads the e-MFP/SPTF project through which she drafted a framework for evaluating the social performance of SME ﬁnance. The ﬁnal paper will be released during EMW 2018. Laura Foose is the executive director of SPTF.